A thermostat allows you to tell the air conditioning or heating unit what temperature you want the air in your house. Most of us know this basic feature, but with so many different options available today, it can be hard to know just what type to chose. 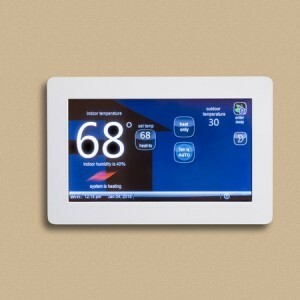 Are you looking for thermostat installation in Denver? So, if you’re feeling a bit intimated with your thermostat installation give your trusted company, Sanders & Johnson a call. We are here to inform you on your best needs. Have you ever wondered which air conditioning thermostat should I use? There are many different types on the market today. Some thermostats are integrated into you phone app and security app on your house! This can be a confusing installation for those that don’t know the wiring but want the remote convenience. • Mechanical — Remember that round sliding thermostat on the wall at your parents old house? Mechanical thermostats are a good choice for some because they are durable, and simple to operate. • Learning — One day someone thought to themselves “man it sure would be nice if I didn’t have to tell my thermostat what to do everyday,” and so the learning thermostat was born. A learning thermostat is an incredible piece of modern technology. They can be operated from your smartphone, and they learn your usage habits so you don’t have to tell them what to do. • Programmable — If you’re looking for the benefits of a learning thermostat, but you’re just not ready to take the plunge yet, then a programmable thermostat could be the right choice for you. With a programmable thermostat you can set it around your life. When you go to work let it know to go down a few degrees and kick back on just before you return. So when you’re looking for an air conditioning thermostat in Denver, CO make sure to give the experts at Sanders and Johnson, Inc. Heating and Air Conditioning a call today 303-422-6606. Just use our Contact Us form for a fast response!